The quality management system of ELSIB was first certified as conforming to ISO 9001 standard in 1997. 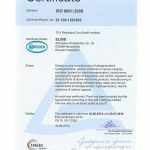 Latest certification renewal audit was performed at ELSIB in 2013 by TÜV Rheinland InterCert Kft. 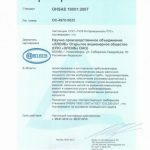 (Hungary) as represented by certification body in Russia TÜV International RUS Ltd., which confirmed that ELSIB operated under quality standard ISO 9001:2008 and therefore was issued the Certificate No. 7510070393 dated July 30, 2013. 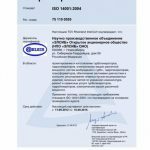 Environmental management and health and safety management systems based on standards ISO 14001 and OHSAS 18001, respectively, were developed and implemented by ELSIB in 2011. At the same time they were integrated with existing quality management system. Certification audits for both systems was performed in February, 2012 by TÜV Rheinland InterCert Kft. and confirmed their compliance with standards ISO 14001:2004 as well as OHSAS 18001:2007 and GOST 12.0.230-2007. Renewal audit in February 2013 confirmed that the environmental management and health and safety management systems were unchanged and all requirements of corresponding standards were met. Customer trust and confidence and positive company image.